The start of a new year usually means resolutions to eat healthier, lose weight, and be fit. These tasks can often be daunting, and viewed as impossible. Healthy eating seems like it would result in bland, tasteless food without any substance. However, you can make food that's healthy and delicious! 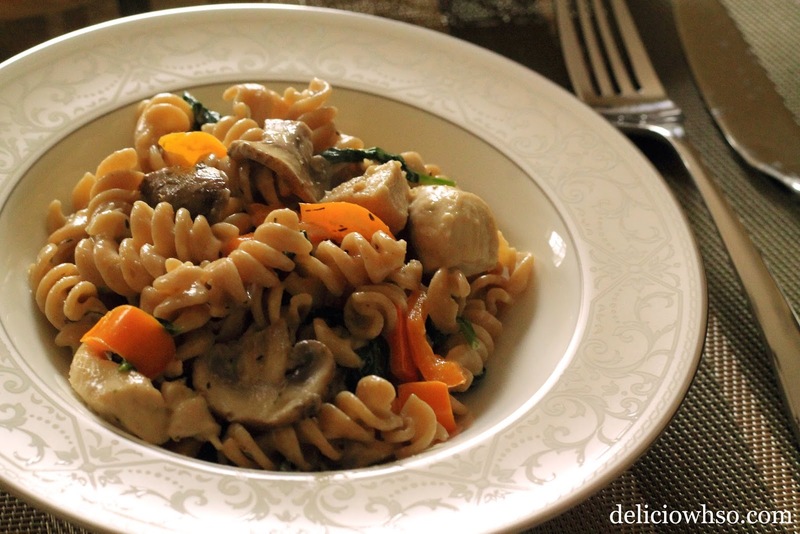 Making healthier choices can be as simple as using whole wheat pasta or adding a few more veggies. Skip butter for low-fat oils, and seek to eat lean meats. I decided to take food that I really enjoy and choose healthier options. Try this simple, inexpensive, and quick recipe to kickstart healthy eating for your family! 1. In salted water, boil pasta to al dente, following the package directions. 2. Cut mushrooms into slices, dice bell pepper, and set aside. 3. Cut chicken breast into bite-size pieces. 4. In a hot pot, large saute pan, or wok, pour olive oil. When the oil is hot, add chicken and seasonings. Cook for about 3 minutes, until the chicken is almost completely cooked. 5. Then, add vegetables and cook slightly, for about a minute. 6. Add pasta, lemon juice, cream, and the remaining seasoning. 7. Mix thoroughly so that all of the flavors are well incorporated. 8. Remove from heat and serve to your close friends and family. This may not be the healthiest option available, since it has a lot of carbs from the pasta and is made with cream, but it is a healthier way to enjoy pasta. Eating healthy does not mean that you have to restrict yourself to unseasoned chicken breast and kale for every meal; you can make healthier choices and reduce portions to create a flavorful, delicious, and simple meal. Happy New Year everyone! I hope this year is filled with lots of blessings and good fortune! Continue to share this blog!